Don't Text and Drive: SmartWheel | OhGizmo! By Natalie on 01/11/16 • Leave a comment! Do not text and drive. Texting while driving is a serious problem due to the high accidents and fatal rates reported. By the time it takes to check a text message, a car can travel a distance greater than a football field while the driver is not looking at the road. Many fatal accidents are attributed to texting while driving. The SmartWheel is designed to prevent such fatalities from occurring by detecting if the driver is texting when they should be driving. The SmartWheel was invented by T.J. Evarts. Evarts wanted to create a proactive safety device that could detect issues before an accident occurred. He compared his invention to other reporting tools that only provide information after an accident. He was inspired to invent the SmartWheel when he witnessed a friend texting and driving. 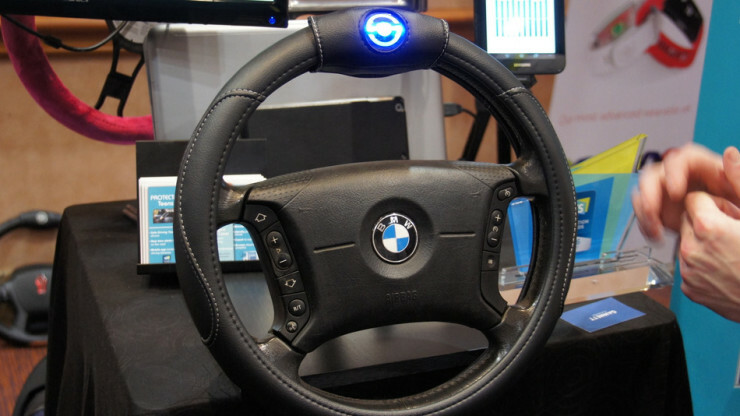 The SmartWheel is designed to work on most cars, it is simply placed over the steering wheel. 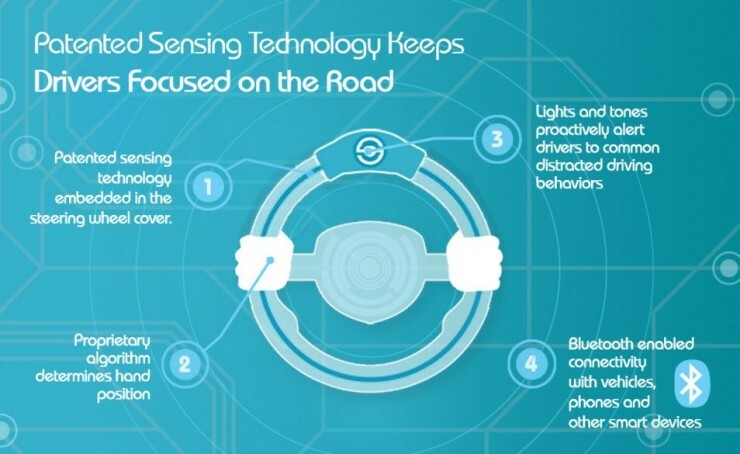 Sensors in the SmartWheel can detect if the driver has both hands on the wheel or not. It is ideal to drive with both hands on the steering wheel and hence, this device senses that. If the SmartWheel detects that the driver does not have both hands on the wheel, it will sound an alert and start flashing. SmartWheel can also communicate with an app. It will alert the owner of the car with access to the SmartWheel device if the driver of the car is not keeping both hands on the wheel. This will provide parents with a way to track how safe their teens are behaving while they are on the road. The main feature of SmartWheel is its ability to alert the owner of the vehicle in real time if the driver takes their hands off the wheel. This feature adds an element of accountability. Drivers are more likely to keep their hands on the wheel if they know they are being monitored. This feature can be used by parents to track their teen’s driving habits or by companies. TTIG plans on monitoring their field technicians for their safety and the public’s with this device. Companies will be able to take precaution and corrective action with this innovation. The main advantage is that everyone on the road will be a bit more safer. SmartWheel is expected to be released to the public sometime in 2016 for about $199.